Indulge in a conditioning treatment formulated to softly nourish and fortify your hair while protecting it from the sun and other harsh elements. 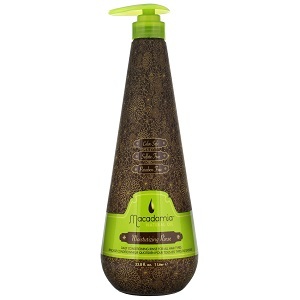 The Macadamia Moisturizing Rinse is an advanced conditioner that will leave hair luxuriously soft, manageable, and ready to style for the day ahead. After cleansing hair with Macadamia Rejuvenating Shampoo, work the Moisturizing Rinse from the roots to ends being sure to cover all areas. Leave in for 30-60 seconds. Rinse thoroughly. For fine to medium hair types, leave in for 1-3 minutes and rinse. For thick to coarse hair types, leave in for 3-4 minutes and rinse. Water (Aqua), Cetearyl Alcohol, Cetyl Alcohol, Stearyl Alcohol, Behentrimonium Methosulfate, Argania Spinosa Kernel Oil, Macadamia Ternifolia Seed Oil, Hydrolysed Barley Protein, Hydrolysed Wheat Gluten, Hydrolysed Silk, Hydrolysed Soy Protein, Wheat Amino Acids, Ethylhexyl Methoxycinnamate, Cyclopentasiloxane, Dimethiconol, Glycereth-26, Panthenol, Amodimethicone, C11-15 Pareth-7, Laureth-9, Glycerin, Trideceth-12, Polyquaternium-69, Guar Hydroxypropyltrimonium Chloride, Cetrimonium Chloride, Hydroxyethylcellulose, Aminomethyl Propanol, Phenoxyethanol, Methylisothiazolinone, Fragrance (Parfum), Linalool.